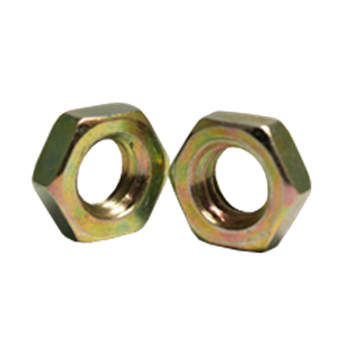 Hex Jam Nuts are six-sided internally threaded fasteners with a thickness that is only 2/3 that of a full form nut. Hex Jam Nuts are tightened against the work surface and a finished or heavy hex nut is tightened against the jam nut to keep it from loosening. Our inventory of hex jam nuts include plain, steel CR+3 zinc, zinc yellow, stainless steel and hot dip galvanized.